We look forward to hearing from you and of course any initial discussions and proposals are free! When you contact us via phone, email or chat, we will connect you with the right person based on your interests and needs. In our line of work, we deal with some really confidential information. We would like to assure you that confidentiality is our top priority. We sign non-disclose agreements often and can provide a document for this purpose if desired. We create custom software solutions for the world's most unique business ideas. Contact our custom software specialists today! 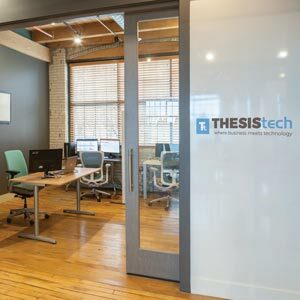 Copyright © 2019 | ThesisTech | All Rights Reserved | Web Design & SEO by Web Traffic Partners, Inc. Subscribe to our monthly business technology updates! Excel, Access, Web & Mobile Apps, CRM, SharePoint and more. Fill out the information below to be added to our email list!